The drum is the first language of the heart. Drumming brings a tremendous joy and sense of deep connection and oneness. Order your CD by Clicking Here. 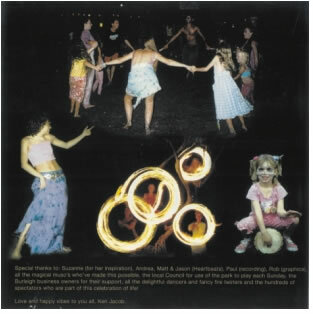 On 19th August 2001, Ken Jacob and a few friends got together on Burleigh Heads beachfront to drum together for some fun. Initially it was for their own pleasure to play in a peaceful setting close to nature but almost straight away people stopped to listen and wanted to join in or know what was happening. “People are just drawn to it, it brings people together” says Ken. 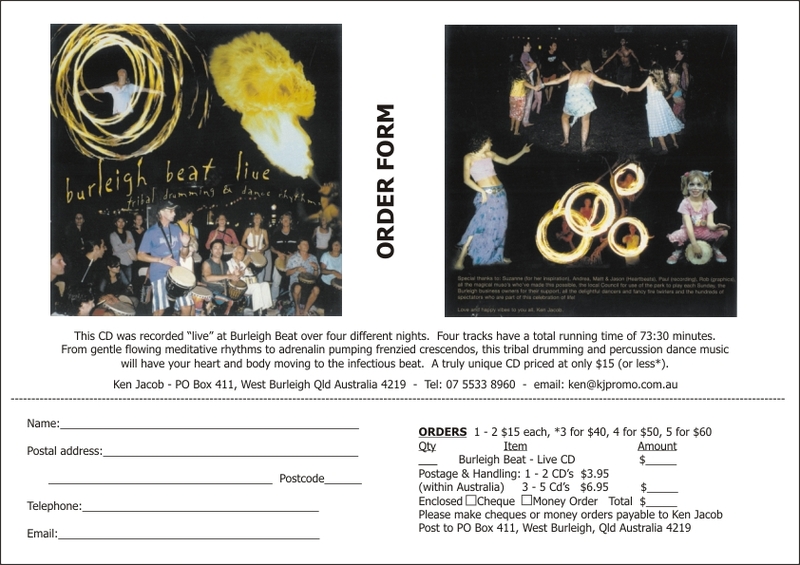 Today “Burleigh Beat” is a spontaneous gathering of hundreds of people of all ages and from all walks of life who gather to drum and dance, fire twirl or simply soak up the great atmosphere. People are welcome to bring along and play whatever they like from African djembe drums, percussion instruments of all types, didgeridoos or just clap your hands and tap your feet. The gathering happens every Sunday night in Justins Park on The Esplanade at beautiful Burleigh Heads beach on Australia’s Gold Coast. People gather before dusk through till 8.30pm (the council permit time) to share their love of tribal drumming and percussive dance rhythms. 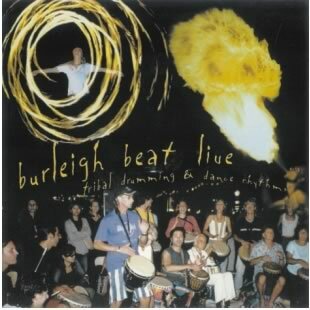 In 2002 a special CD was recorded “LIVE” at Burleigh Beat with the proceeds to go to Ken Jacob to thank him for all the effort he had put into starting this gathering and keeping it going with all the problems and objections that he had faced in getting a permit to keep this wonderful family gathering going. This “LIVE” recording captured the essence of some of those magical nights during 2002. From gently flowing meditative rhythms to adrenalin pumping frenzied crescendos this music has your heart and body moving to the infectious beat. faster, your whole body is dancing and your soul is uplifted….” Tiffany Street. 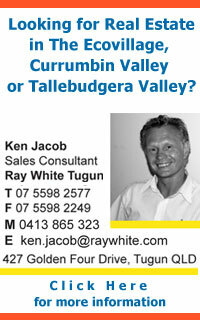 CD for all to enjoy again and again…….great for just putting on and dancing around one’s lounge room!” Arianne Cross. Ken wishes to thank: Suzanne (for her inspiration), Matt & Jason (Threeworlds), Andrea, Paul (recording), Rob (graphics), all the magical muso’s who made this possible, the Burleigh Heads Council for use of the park to play each Sunday, the Burleigh business owners for their support, all the delightful dancers and fancy fire twirlers and the hordes of spectators who are part of this celebration of life!